MLS# 180063629 - 324 Sycamore Creek, San Marcos, CA 92069 - Abacus Properties Inc. Stunning open and airy Twin Oaks Valley home! 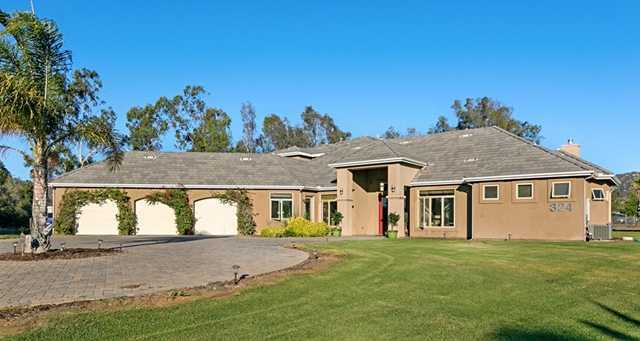 One acre,flat/usable lot.Can be used for horses.Quality finished throughout.Best of both worlds, just minutes from the freeways but with a ranch feel.Some of the features:Several extra large windows,13′ kitchen island,3 AC units/ separate zones,2 tankless water heaters,3 fireplaces,all bedrooms en suite,office with exterior door,over sized laundry/craft/Utility room with built in cabinets and exterior door,finished 3 bay garage/1 drive thru bay,paver driveway. I would like to schedule a private showing for this property: MLS# 180063629 – $1,179,000 – 324 Sycamore Creek, San Marcos, CA 92069.